Made from refined linseed oil blended with a quality pigment and solidified into a convenient stick form for a rich creamy buttery consistency. * Ideal for sketching outlining or covering large areas and colors are mixable. * Paintstiks are self-sealing; they form a protective film so color won't rub off or dry out yet they always stay moist and fresh for an indefinite shelf life. 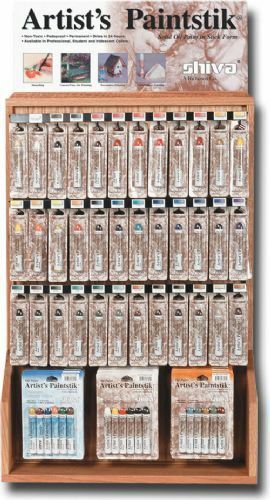 * These oil paint sticks can be used with traditional oil paint techniques mediums varnishes and surfaces. * 6 each of 52 carded colors and 6-piece sets in basic traditional and iridescent primary.